Cant find the pricing for the landline that you seem to be mistaken to believing is obvious that is required. I clicked thru about 4 different pages and still no notification of the true monthly cost of this plan. Why are you hiding it and putting up the bogus $60 headline rate? Its 60$ for the broadband. Plus you need a homeline, so make that an extra $45 from SS if youre in one of the 3 main centres or you can keep your current landline/tolls provider. hellonearthisman: You don't need to have your phone or tolls with slingshot on this deal. But if you already have a slingshot bundle including landline for $90, switching to this plan would not save you any money at all. They posted a price without mentioning a critical limitation of the service at that price, so its still illegal under Fair Trading Act -- although one could argue that advertising a price that requires a landline is a carryover from the old days of UBS. Funny that Slingshot haven't been able to properly justify their omission. Well spotted WebWat. People looking at this plan, it's not really suitable for gaming. webwat: Funny that Slingshot haven't been able to properly justify their omission. Is that in relation to the web site or this discussion? If it is about this discussion, give it a break: the issue was raised on a Saturday, 10pm, on a long weekend. This seems to be for the old $80/month plan. Nice to see SS with a rep (or is it just a new rep?) on list. MF - are new reps verified in any way to ensure they do actually represent the company and have appropriate management approval to be commenting? It will be fantastic to see some TrueNet stats on how this plan stacks up. It does seem that your company is working extremely hard to address 'customer perception of risk' (note the item I bolded above). I get the impression, as a very interested observer of the whole market, that SS have often brought products to the market that everyone is excited about and then done a lot of brand damage by not managing that demand by limiting customer numbers and backing it up with scaling. What I'm reading here really does sound good... hopefully not 'to good to be true', but you are wining back some confidence, which is really nice to see. thats probably if you buy it *with* the homeline. i assume the 12 months relates to the homeline bit, not the broadband unlimited bit. DonGould: Nice to see SS with a rep (or is it just a new rep?) on list. By the way, the deal seems to be legit, as we have an order for ads starting later this week. why are all you guys so quick to trash companies and throw out the "hidden charges", "false advertising" and "illegal under fair trading" claims. Really, you should be applauding this company for persisting to offer and improve a service that everybody seems to want, yet most other companies have run away from providing .. The results of any testing are only valid if the ISP treats the sites under test the same was as any other site. This hasn't always happened in the past and the gaming hasn't been limited to just one provider. I also don't know if the gaming has specifically happened to Truenet (yet). My point is that it's possible to make a service look exceptionally good by giving special treatment to some sites. I am in NO WAY suggesting Slingshot would do this - just pointing out that it HAS HAPPENED in NZ before. Talkiet: The results of any testing are only valid if the ISP treats the sites under test the same was as any other site. This hasn't always happened in the past and the gaming hasn't been limited to just one provider. I also don't know if the gaming has specifically happened to Truenet (yet). I am sure John is all over this one by now as it's a well documented claim. I agree, testing of this service really does need some random international sites to be pulled so that SS can't fudge the testing. Given the resource John has in those testing units, I'm sure he can move random URL information to them in a secure way and then hit those sites at random times so that the NOC guys at SS can't fudge it to easily. It does mean that TrueNet need a really good sample base though. Using netflow tools, it wouldn't be to hard to figure out where the probes are and then just focus special attention on those connections. If every SS user had a probe then it would have to mean special attention for every connection... sort of levels the playing field. Really this is just as much about user commitment to keeping the game honest. If users care then I'm sure they'll pitch in. On the other hand, they may just feel that the value of no risk of bill shock is high enough to off set any lack in performance as long as the performance doesn't drop to low. I wonder if we're going to see more and more homes like yours Neil? 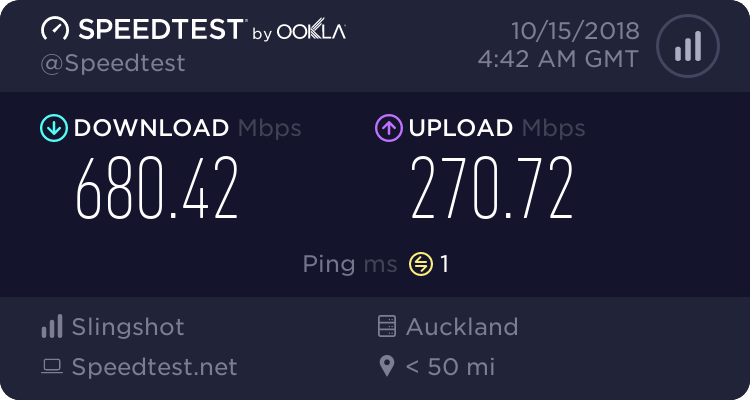 A place where people have more than one DSL connection - one for speed, one for volume.